Last Saturday after our group run we had a great speaker from Fleet Feet come by and speak to our training group. Matthew Abitbol is an accomplished marathoner with 50+ marathons under his belt. One of the things he mentioned that we need to keep in mind during races and especially during endurance runs like the marathon and half marathon is the “we are all in this together” mentality. 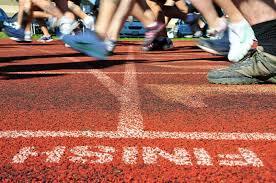 In almost any endurance race we do, pain as well as physical and mental exhaustion is inevitable. Regardless of whether this is your first race or if you are an elite, that pain is going to happen. You are going to feel tired, and your mind is going to start playing tricks on you. Whether you run a 5 hour marathon or finish in under 3 hours, we are all feeling the same things. Some of us just finish with that pain a lot faster than others! By keeping this in mind, we can use this mentality to pull us along. As we start to feel exhausted and waver, we can remember that every runner around us is feeling these same things to some extent. Knowing this can be encouraging and help us to avoid that process where we start to rationalize why we might want to slow down or even quit. 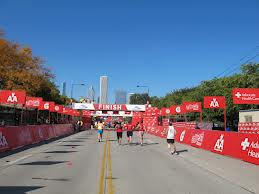 Abitbol pointed out that this was a huge factor in the success of many runners during last year’s Chicago Marathon. The energy of last year’s marathon was electric and the statistics proved this helped. Last year’s number of finishers was well above the average, seeing far fewer DNF’s than other marathons typically have. The mood of the race and the runner’s helped set the pace and push athletes towards the finish. Rock experienced this himself last year during Chicago when his hip flexor revolted and he had to walk the last few miles. As frustrated as he was, he refused to back out of the race. He had trained for this and he was going to finish darn it! While he hobbled his way toward the finish numerous runners stopped to give him a pat on the back or offer help. Looking back it was a frustrating race for sure, but the attitude and camaraderie helped push and inspire him until the end. All of this is important for us to keep in mind as we train and approach our races. Things are going to get rough. Our bodies are going to ache. Our minds might try to think of dozens of reasons why we should quit. But using the “we are all in this together” mentality can be a great reminder that we are not alone. Put another way, misery loves company and we are definitely in good company. Keep on pushing on my friends! ← Running Partners: It Was The Best Of Times. It Was The Worst Of Times. We definitely are all in this together–that is why smiling to each other, sharing a bit of the load–it helps so much! Yes a smile can really go a long way! That is a wonderful point. Thank you so much for sharing. Group fitness classes definitely have that same vibe and I would agree that it is what keeps us coming back. Oh you’re so sweet! You’ve got this. It is just a good reminder. We all struggle but it is nice to know we aren’t alone as we struggle. So proud of you and your hard work! I know. It sounds incredible and I can’t even imagine getting close to 50. Plus he started running 7 years ago. So glad you are finding some great running friends! Loved this post! Such a needed message.